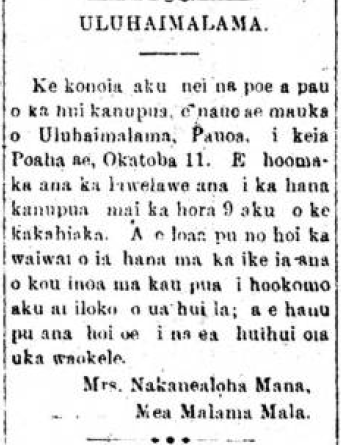 The beginnings of Uluhaimalama, 1894. Everyone in the flower planting association [? hui kanupua] is invited to make their way to Uluhaimalama, Pauoa, on this Thursday, October 11. The flower planting will begin from 9 o’clock in the morning. And the importance of the efforts will be seen by having your name by your flower placed by the association; and you will also breathe in the bracing air of the upland forests. Ka Oiaio, Buke VI, Helu 40, Aoao 3. Okatoba 5, 1894. This entry was posted in Alii, Aloha Aina, Farming and tagged Liliuokalani, Nakanealoha Mana, Pauoa, Uluhaimalama by nupepa. Bookmark the permalink. Halau I Ka Wekiu is caring for the Pauoa garden site set up by Lili’uokalani after the overthrow. Tending a red lehua tree are Leilani Williams-Solomon and kumu hula Karl Veto Baker, center, and Michael Casupang. A plaque in Hawaiian identifies the site of Liliuokalani’s garden on ‘Auwaiolimu Street. A garden created by Queen Lili’uokalani in 1894 as a symbol of hope for Native Hawaiians was destroyed by Hawai’i’s provisional government, with the land divvied up and turned into several cemeteries. At a private ceremony tonight, Native Hawaiian leaders will join a hula halau spearheading the effort to restore Lili’uokalani’s garden in a rededication of Uluhaimalama on the 115th anniversary of its founding. For Halau I Ka Wekiu, its kumu hula Karl Veto Baker and Michael Lanakila Casupang, and other supporters of the garden, the restoration of Uluhaimalama has come to symbolize the plight of Native Hawaiians since the overthrow. The spot is tucked away at the mouth of Pauoa Valley a short horse ride from old Honolulu. That’s where the queen asked her supporters to plant a garden in 1894, the year after the overthrow. Unspoken, but obvious to Native Hawaiians of the day, the queen was offering up a place where people could gather, plant, enjoy the beauty of their works, and talk, Baker said. “She kinda knew that this little place could be, without saying it, a place where you could gather,” Baker said. On the night the garden was first dedicated, those gathered sang “Kaulana Na Pua,” the allegorical song that seems to speak of the beauty of Hawai’i’s flowers but is actually a protest of the overthrow. Paula Higuchi, who wrote a research paper on the history of Uluhaimalama, said the provisional government uprooted the plants when they learned the full meaning of the garden. But few know of its significance or place in Hawaiian history. To most members of the halau, Uluhaimalama Cemetery was the small parcel only a stone’s throw from their halau that was overgrown with weeds, vegetation and debris. They took on monthly cleanups of the site in March 2005 as a community service project because it it is customary for a halau to take on “kuleana” or responsibility for an area in their neighborhood, Baker said. “At first when we took care of this place, we didn’t understand the meaning behind it all,” he said. Gradually, they learned the history and significance of Uluhaimalama, and the halau’s interest in restoring the garden was raised to another level. Earlier this year, the halau’s foundation received a $20,000 grant from the Office of Hawaiian Affairs that allowed installation of a water meter and sprinkler system. The halau’s members trenched the grounds to install the water line, then began replanting native plants that the queen had asked be placed there, Baker said. Among them are the lehua, kou, kukui and lauhala trees, as well the purple crown flower plant, Lili’uokalani’s favorite. A pair of benches were placed under a kukui tree near the top of the garden. The halau and the garden’s other supporters say the work done to date is only the beginning and that they intend to do more planting to beautify the garden. Meanwhile, aided by Higuchi’s research, the Native Hawaiian Chamber of Commerce began a quest to place Uluhaimalama on the National Register of Historic Places. The application is pending. Kaleo Paik, treasurer of the Uluhaimalama Cemetery Association, which is part-owner of the site, said her group applauds the halau’s work. The association’s long-time members aged, and resources to maintain the cemetery dried up, Paik said. “It sort of fell through the cracks,” she said. The chamber is also trying to help the association raise money to place walkways to the graves and put in better soil, Paik said. Tonight, traditional dances, chants and a planting ceremony will be performed to commemorate the events that took place 115 years before. Expected to attend are Office of Hawaiian Affairs board chairwoman Haunani Apoliona and Quentin Kawananakoa, who will represent the royal Kawananakoa family. Because the site is small and lacks parking, organizers of the event made it invitation-only. The public is welcome to visit the garden and cemetery at other times, they said. The original Uluhaimalama is believed to have been much larger and to have incorporated surrounding areas, including some neighboring graveyards focused on those of Chinese descent.